The NBA regular season ends in exactly 57 days, and in that time, the New York Knicks will play 32 games and the Brooklyn Nets will play 29. 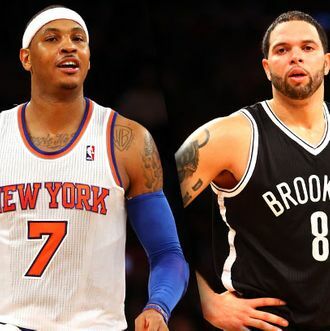 On April 17, that last day, it is extremely likely that both teams will be in the playoffs: John Hollinger’s Playoff Odds Report has the Knicks with a 99.9 percent chance to make it, and the Nets at 97.9. So no matter what, both teams will avoid disaster. But what are the ceilings for these teams? Is either one a legitimate challenger to the Heat? Can they get better by playoff time? With the season kicking back up tonight post All-Star break — the Nets host the Bucks, while the Knicks travel tomorrow to play Indiana — we thought we’d take a look at questions facing each team heading into the second half. 1. Will they keep playing so slow? The Nets have tons of offensive talent and a point guard who theoretically plays better in an uptempo offense. But they still run their offense through Brook Lopez and in an isolation-heavy, plodding, conventional offense. This has generally worked out all right, but it’s still an odd fit for this collection of talent. The Nets have been the most successful — and certainly the most enjoyable to watch — when they’ve been running. 2. Yeah, is Williams going to wake up? Perhaps the most important question for the Nets: What’s the deal with Deron Williams? He’s had some lingering injury issues, but he barely resembles the superstar he was in Utah, the player many thought could legitimately challenge Chris Paul for the title of best point guard in the NBA. (Heck, the Nets looked better with Tyshawn Taylor last week.) The Nets built their entire franchise around Williams, and right now, he’s not holding up his end of the bargain. 3. Can Lopez keep this up? Brook Lopez has been the Nets’ best player by a wide margin in the first half. He’s fifth in the NBA in PER, and his defense, while certainly not overwhelming, has been perfectly adequate, particularly when he’s playing alongside Reggie Evans or Andray Blatche, two other Nets pleasant surprises. It’s a good thing, because the other vets (particularly Gerald Wallace, whose game is becoming a phantom of its former self) appear to be regressing while he progresses. 4. Will they make a trade? The Nets desperately want to upgrade the power forward position, but it’s tough to see how it happens. Atlanta’s Josh Smith is the ideal target, but the Nets don’t have close to what it would take to get him. (They’re having the same issue with Paul Millsap.) They’d love to ship out Kris Humphries and his massive contract, but it’s tough to see anyone leaping at that opportunity. They could also target a bench scorer like Ben Gordon, but again: This isn’t a roster built for flexibility. 5. Can they get home-court advantage in the playoff’s first round? The Nets are terrific at home — 19-10, only 12-12 on the road — so finishing in the top half of the Eastern Conference is imperative. They’re only two and a half games behind the Knicks for the Atlantic Division title (with the Celtics charging hard, two and a half games behind), and they’re a half-game up on Chicago and one game up on Atlanta for that fourth spot. The schedule’s a lot tougher in the second half, with 17 of those 29 games on the road. The last thing they want is to be facing a Chicago team, potentially with a newly returned Derrick Rose, in the first round without homecourt advantage. 1. Can everyone get healthy at the same time? As strange as it might have seemed in the preseason, the Knicks really need Rasheed Wallace and/or Marcus Camby to return; their defensive swoon has coincided with the absence of both players. Wallace could be practicing this week; Camby is more of a question mark. It’s not just them; Jason Kidd’s overuse and fatigue has caused his shot to falter of late as well. This is an occupational hazard of having a bunch of elderly players, but the key, really, is having them all ready come playoff time. The trick is hanging on to a top playoff seed while making sure everybody gets their rest. 2. Will they trade Iman Shumpert? Shumpert’s agent denies he requested the Knicks trade the second-year swingman, but if the Knicks are going to get any help at the positions they need — namely, another backup point guard and maybe another shooter — Shumpert might be the lone chip they have. (Steve Novak, who can barely get his shot off anymore, is another possibility.) The view here is that the Knicks hold onto their lone young player, but the Knicks are in total all-in mode and may think that all that matters is what gives them the best chance to win a title this year. This is where Jared Dudley and Luke Ridnour come in. 3. Can the second unit hold up? With J.R. Smith and Amar’e Stoudemire both coming off the bench, the Knicks have a potent, potentially dominating backup crew. But that still comes with its own questions. Can Amar’e continue to be so excellent on offense that it offsets his weak defense? Can Smith avoid his cold shooting spells? Perhaps most important: Have we figured out which of them, if any, is in at the end of games? We’ve seen some improvements in spacing with Amar’e and Carmelo — Anthony seems to particularly enjoy finding Stoudemire slashing to the basket — but enough to where it can be counted on in the clutch? 4. Can Carmelo continue to play like an MVP? Well, an MVP in a year that LeBron James and Kevin Durant took off, anyway. Carmelo is having the best year of his career both offensively and defensively, and it’s very possible this will be his best-ever chance at a title as the lead dog on a team. (We still have fears he’s gonna opt out of his deal in three years and go play with LeBron somewhere else.) He has embraced the pressure that came with this season — pressure he in large part put on himself — and has thrived, winning over fans and skeptics everywhere. Still: The load he carries is a heavy one, and there are worries he won’t be able to hold up physically. You get a sense that no matter what happens, this might be the season they remember Carmelo for. 5. Can they win the Atlantic? The Knicks haven’t been able to hoist an Atlantic Division title banner since 1994 (back when Miami and Orlando were in the division, back when Washington was the Bullets). This might be their best chance. The Celtics are hot right now, but are still five games back and eventually will actually miss Rajon Rondo. (Though they are without question the team the Knicks want to play the least in the first round.) The Nets, as established, have plenty of issues of their own. Nobody else in the division is close. If the Knicks are ever going to finally win the division and secure one of the top three playoff seeds, it’s this season. Considering all the question marks coming into the year — ESPN had the Knicks fourth in the Atlantic and seventh in the conference preseason — and considering the last couple of decades of pain at the Garden, this is amazing to even contemplate. The Knicks have every opportunity to make it happen.